Excellent Sheep takes a sharp look at the high-pressure conveyor belt that begins with parents and counselors who demand perfect grades and culminates in the skewed applications Deresiewicz saw firsthand as a member of Yale’s admissions committee. As schools shift focus from the humanities to "practical" subjects like economics and computer science, students are losing the ability to think in innovative ways. Deresiewicz explains how college should be a time for self-discovery, when students can establish their own values and measures of success, so they can forge their own path. He addresses parents, students, educators, and anyone who's interested in the direction of American society, featuring quotes from real students and graduates he has corresponded with over the years, candidly exposing where the system is broken and clearly presenting solutions. "Not only does Deresiewicz speak with candor about the ins and outs of the educational hierarchy from an insider's point of view, but he prompts some serious questions about the potential for reform and what we as parents can do to encourage our children from a young age to change the way that they’re learning, and as a result, what they take from the world in exchange. A much recommended read, especially for those currently with or planning to have children." 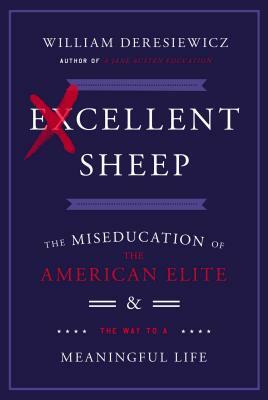 "The ex-Yale professor effectively skewers elite colleges, their brainy but soulless students (those 'sheep'), pushy parents and admissions mayhem." "Unofficial required reading at selective schools."